Gone are the days when I could eat a scrambled egg or bowl of cereal for dinner and call it a night. Now I have three other humans besides myself to feed. All the time! Planning meals is time consuming but an important responsibility that I take very seriously. During the week my family spends the majority of the day apart (except for my twins who are in the same class) so at night I value us coming together for a nutritious and filling meal. 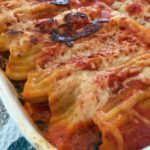 When planning my weekly menu, I look for recipes with clean ingredients and ones that aren’t too time-consuming so I can help the kids with homework or spend time with them. 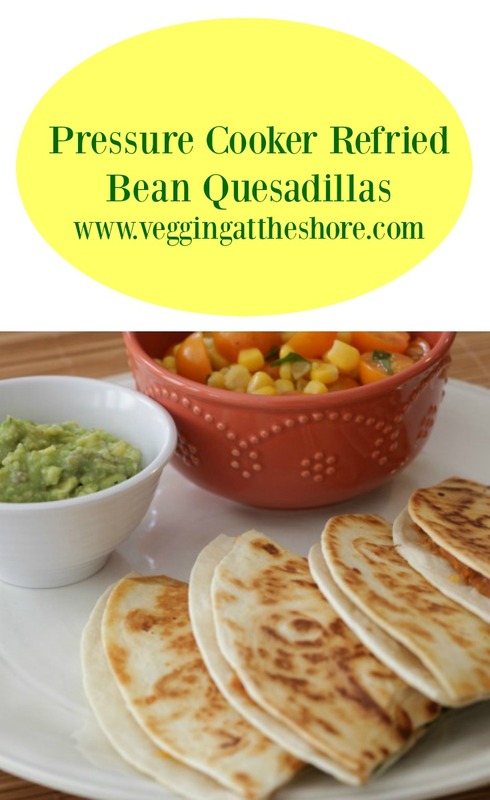 This recipe for refried bean quesadillas is quick to make because the pressure cooker does most of the work and by using Wholesome Pantry ingredients and Frontera products from ShopRite, I feel good about what I’m feeding my family. 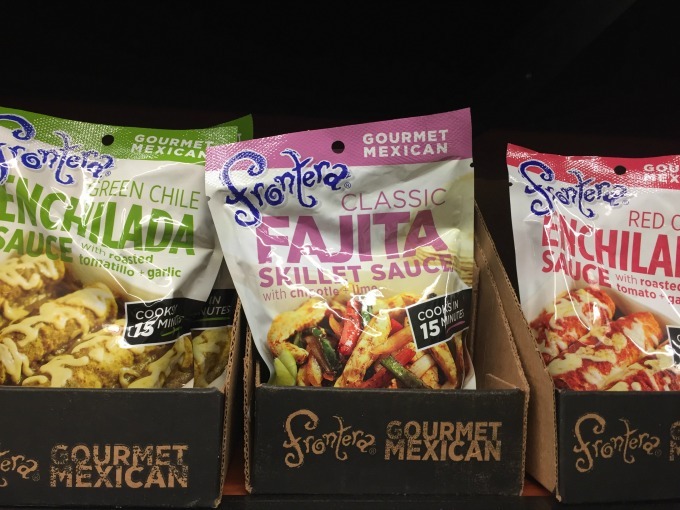 Wholesome Pantry and Frontera products are both brands that I trust. 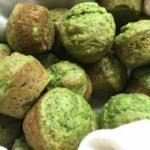 They are easy to find and make for quick and nutrition meals. My weekly farm share is still going strong so I like to combine local produce with ingredients free from artificial flavors. 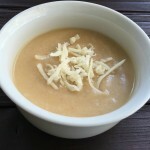 For this recipe, you start by cooking chopped bell pepper and onion in olive oil on the sauté setting of your pressure cooker. 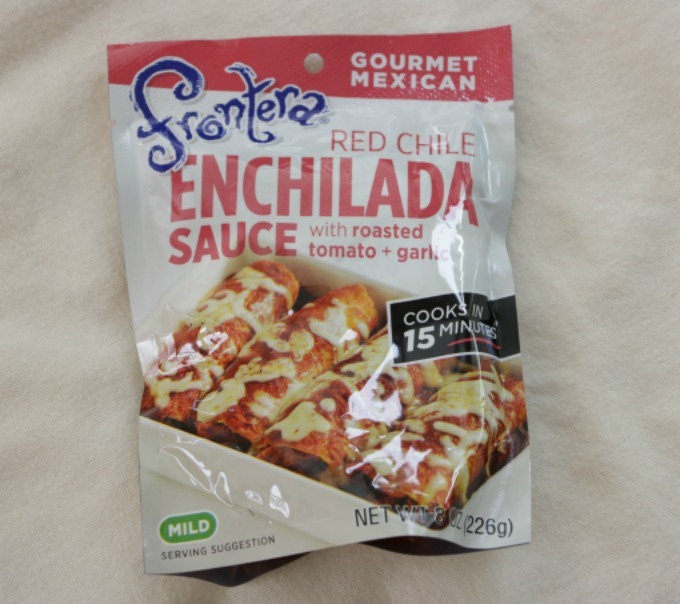 That takes about five minutes and then you add Wholesome Pantry Organic Pinto Beans, Frontera Enchilada Sauce and water to the pressure cooker. Put the lid on, seal the valve and set that to cook for 45 minutes on the pressure cooking setting. 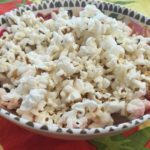 While the beans are cooking, you can prepare your corn salad and guacamole. 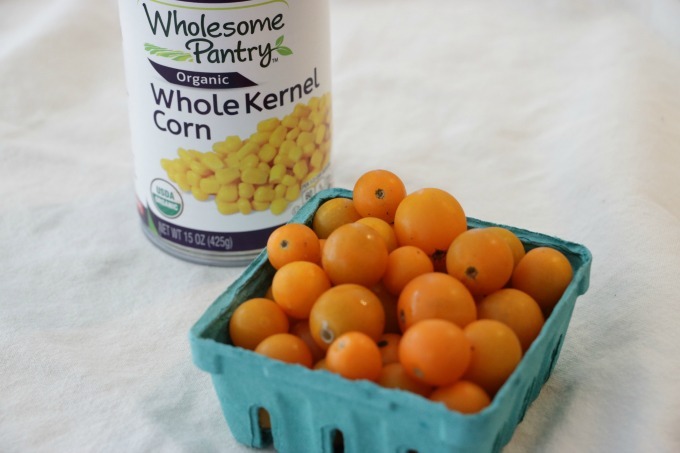 For the corn salad, you combine Wholesome Pantry Organic Whole Kernel Corn along with chopped tomatoes, olive oil, cilantro, lime, salt and pepper. This is one of the easiest and tastiest salads that my family always enjoys as a side dish. At any given moment I have avocados on my counter ripened to perfection. Mash 2 avocados and then add Frontera Guacamole mix to the bowl. 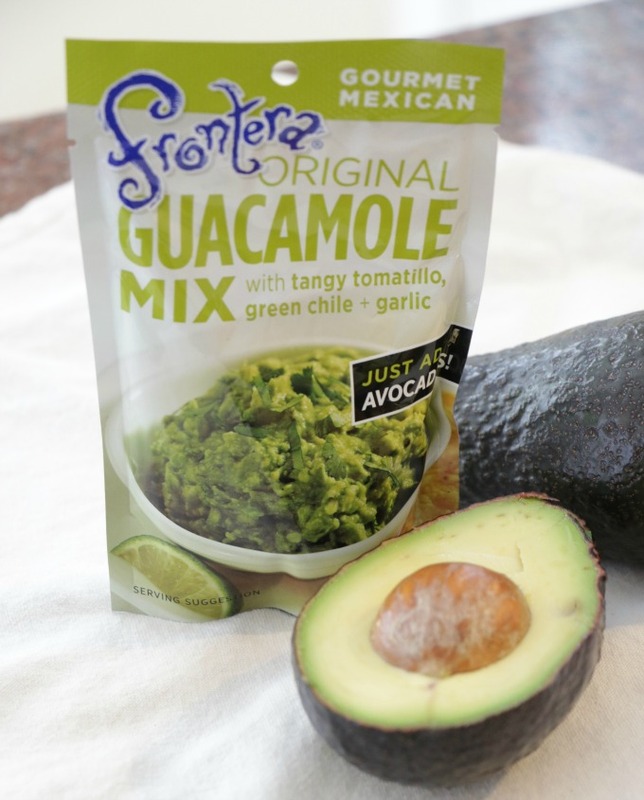 Making guacamole with Frontera mix saves time because you skip the chopping of onions, garlic and herbs. So easy! By this time your beans should be done. 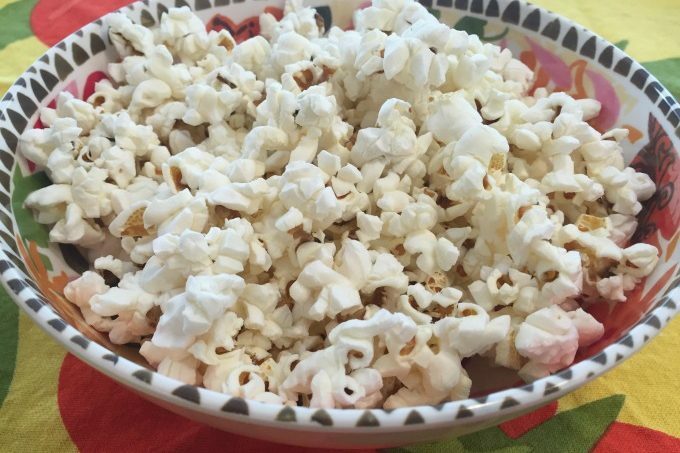 Let the pressure release naturally and then open your lid. Using an immersion blender, mash the beans to your desired consistency. 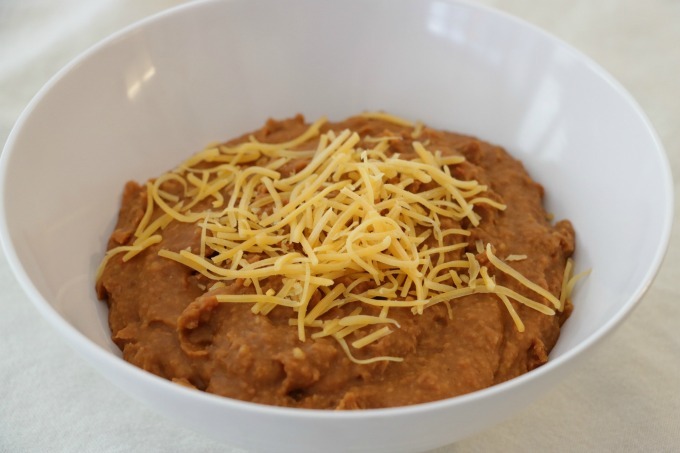 I have to admit, I could eat refried beans on their own topped with some cheddar cheese any day the week, but I usually use it as an enchilada or taco filling. 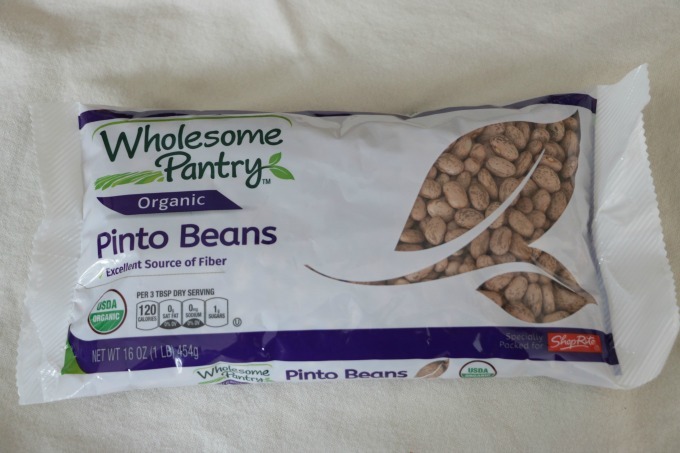 These refried beans taste so much fresher than anything you could get already prepared. 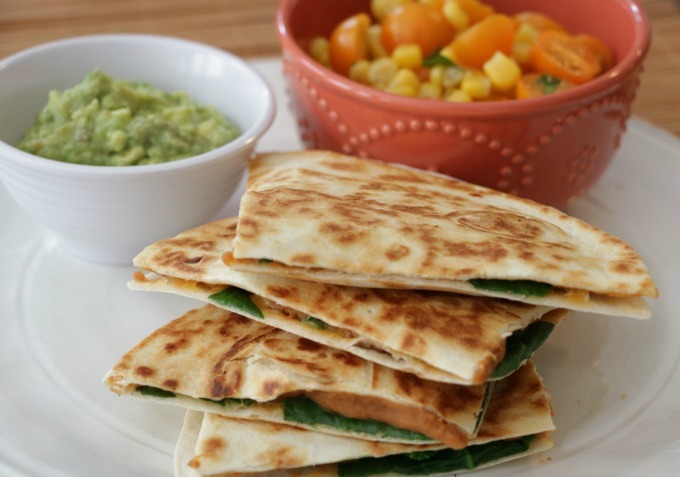 To assemble your quesadillas, spread a layer of refried beans on a tortilla and top it with spinach, cheddar cheese and another tortilla. Add that to a heated nonstick skillet and cook for about 3 minutes per side. Repeat with the remaining tortillas and then cut each one into quarters. 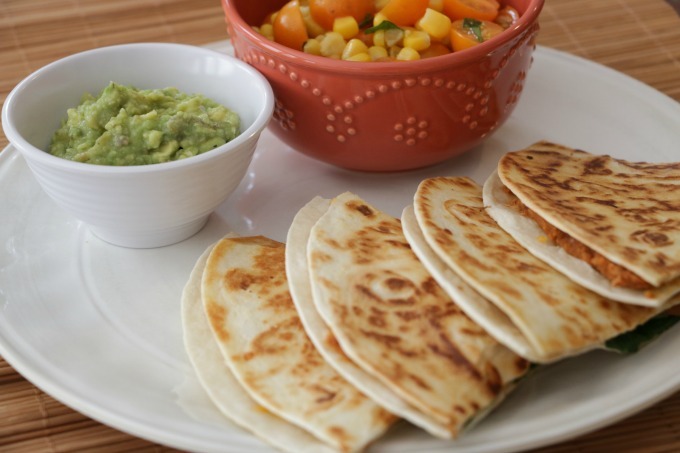 Serve your quesadillas along with the tomato salad and guacamole for the perfect, easy weeknight meal you can feel good about feeding your family. Quick meals like this allow you to spend more time with your family and by using ingredients you feel good about, it’s a winner all around. 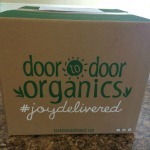 Remember, family dinners do NOT need to be a hassle!! Turn the pressure cooker to saute setting. 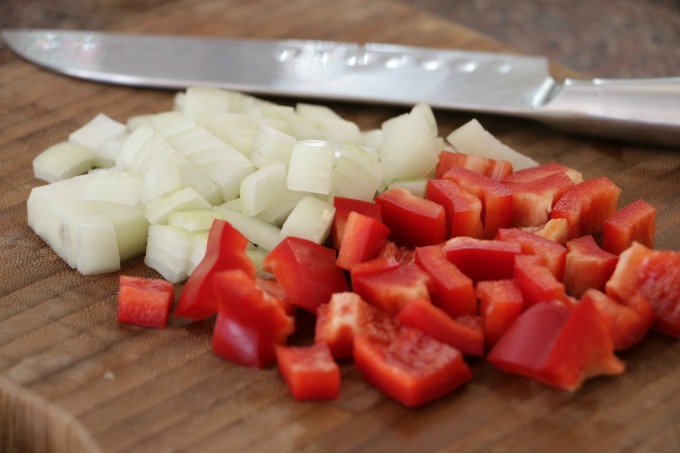 Add 1 tablespoon of olive oil along with chopped bell pepper and onion. Cook for about 5 minutes, until onion softened. Add pinto beans, water or broth and enchilada sauce to the pressure cooker. Pul lid on, adjust valve to seal, press pressure cook and set time for 45 minutes. After beans are done cooking, let the pressure naturally release for at least 20 minutes. 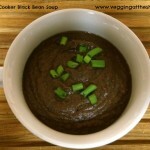 Using an immersion blender, blend the beans until you get your desired consistency. Heat a sprayed non-stick skillet over medium heat. 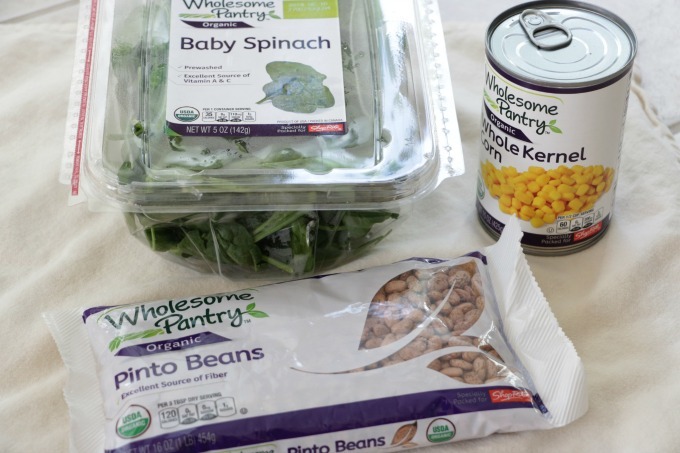 Take one tortilla and spread about a half cup of refried beans, add a handful of spinach along with a couple tablespoons of cheddar cheese. Top with another tortilla and cook in the pan for about 3 minutes per side, until browned. Remove from pan and repeat with remaining tortillas. 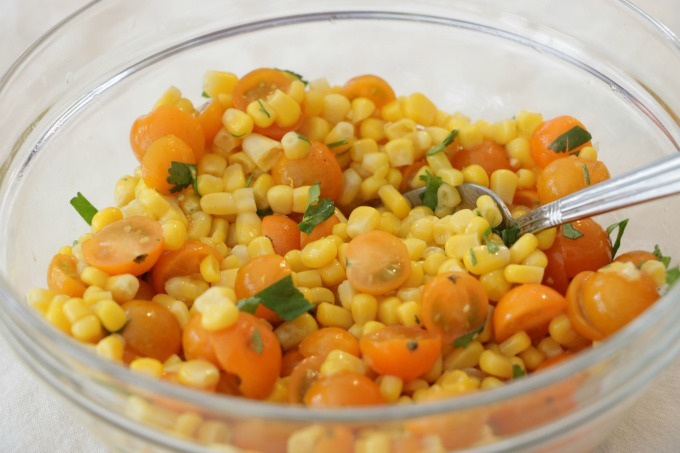 To make the salad, combine the tomatoes, corn, lime juice, 1 tablespoon of olive oil, cilantro and salt and pepper to taste. To make the guacamole, mash 2 avocados and add guacamole mix. Stir to combine. 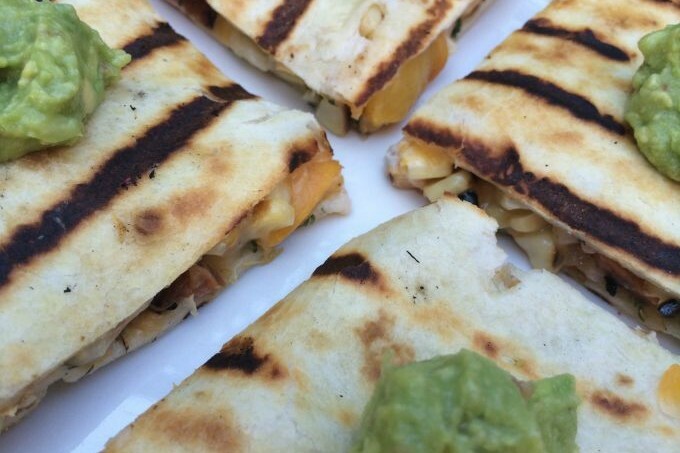 Cut quesadillas into quarters and serve with corn salad and guacamole.